After sleeping in a bag for months at a time, I have a better idea on what to look for in a a sleeping bag for long term survival. I currently own four sleeping bags for different climates and conditions. I slept almost 100 nights in a sleeping bag when thru-hiking the Pacific Crest Trail in 2012, and recently, I spent 180 days sleeping in a bag during my survival expedition. The first thing you must consider is the climate where you will be using your bag. You need to find the historical temperatures of your area; I usually search in Wikipedia for the place and check the climate section. Find the average low temperature for the winter months. That’s your number. Where I live the temperature fluctuates from −21 °C (−6 °F) to + 20 °C (67 °F). This adds a challenge. Because a sleeping bag with a comfort rating of −6 °F is going to be awfully hot in the summer. There are three ways around this. I could use the −6 °F sleeping bag as a heavy blanket, or I could have two bags rated to a warmer temperature that I can also layer up to use during the winter months. A third way is to have a sleeping bag with a warmer comfort rating and sleep with heavy fleece and wool clothes during the coldest months. The US military has gone with the second option with the modular sleeping bag system. Snugpak, a UK military sleeping bag maker has developed a similar combo bag system with the Special Forces 1 bag that goes into the SF 2 bag for colder weather. I’ve gone with a combination of the second and third option. I have a bag with an EN comfort rating of -2 °C (28 °F) and another one with a similar temp. rating (Snugpak Elite 3) that I can layer over it. In addition, I could wear heavy fleece clothes during the coldest days. Not all ratings are made equal; don’t trust the manufacturer’s ratings, only the EN ratings are a good reference. The comfort rating is the one that’s important. The EN comfort rating of your bag should be the same as your expected average low or even colder. Something that I’ve learned by experience is that if you are in a survival situation, in a depleted state, or in a starved state, your body will lower its metabolism. Meaning you will sleep colder and be colder in general. So take that into consideration if you are looking for a sleeping bag for long term survival. I suggest being sceptical with the temperature ratings. Choose synthetic insulation. Down is lighter, but when you sleep in a bag day after day for weeks or months, it will absorb the moisture from your body. A down bag will loose its loft in a long term scenario. Down is also very difficult to dry in the field, in addition to being next to useless when wet. I’ve read that down lasts longer than synthetic insulation because synthetics lose their loft over time. For long term, continuous use, this is not the case. Synthetic insulation is bulkier, but high quality bags are relatively close in weight and bulk to their down counterparts. For example the Mountain Hardwear Lamina Z bag (EN comfort rating 32 °F) weights only 2 lbs. 11 oz. and compresses to 8.1 liters. For short term camping, down works great, but a sleeping bag for long term survival must be synthetic. I prefer mummy bags because they are lighter and warmer than rectangular bags. 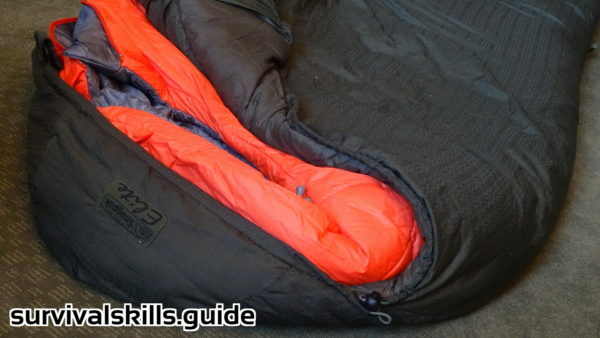 If you intend to layer two bags then you should consider a sleeping bag with more room to use as your outer bag. The Z-lite, is the “compact”, folding pad that I used during my PCT thru hike. It is extremely durable and light, although not very portable compared to an inflatable pad. R-value 2.6, 14 oz. 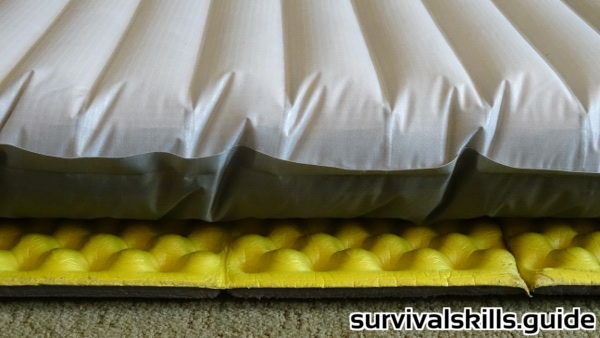 The NeoAir XTherm, is an ultralight inflatable sleeping pad; it took me four years to destroy the less durable version of this pad, so I trust that it can last a year if properly cared for. R-value 5.7, 15 oz. 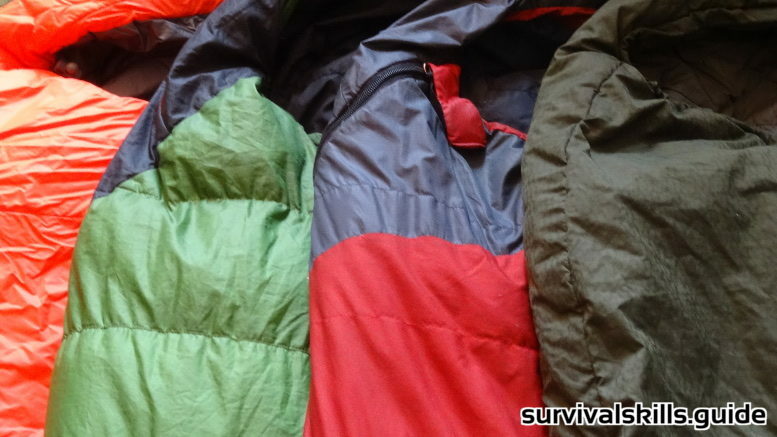 A sleeping bag is one of the top essential items to have in a long term survival scenario. Right there with a good knife and a fire starter. A high quality synthetic sleeping bag is worth its weight in gold; in a survival situation they are a game changer. 2 Comments on "Sleeping Bag for Long Term Survival: How to Choose"
I don’t think a cover adds much r value, unless it is thick. A cover will also reduce venting. The one thing the covers are good for is water protection. But a tarp or tent would be better in a long term situation, than having just a bivy sack. Bivy sacks retain condensation, and they are not great under torrential rain.